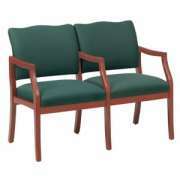 Treat clients and visitors to a pleasant wait with cozy reception furniture from Lesro. 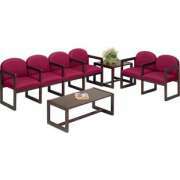 With a huge selection of value-priced reception seating, you can find great styles that will fit any space or budget. Attractive fabrics and warm wood hues will create a positively inviting space, so visitors won't mind the wait. 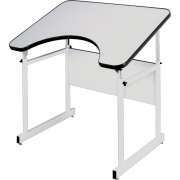 Lesro also brings you great conference tables and library furniture. 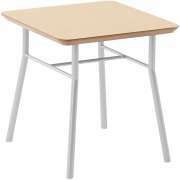 Their products are Made in the USA and come with a Limited Lifetime Warranty, so you are guaranteed to enjoy this innovative, high-quality furniture for many years to come. 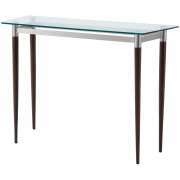 Liven up your reception area, office, conference room or library with the simple elegance of Lesro. 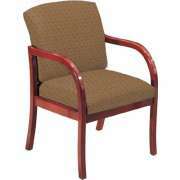 The reception seating experts offer an unbelievable selection of lounge chairs and reception chairs. 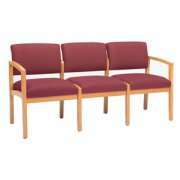 No matter what size waiting room you have, you can easily find some appropriate reception seating from Lesro. Models are available with and without arms. 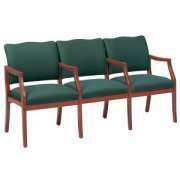 They can be ordered as individual units or as long rows of attached seats. A selection of fabrics enables you to coordinate lobby chairs with any decor or color scheme for a well-matched professional space. 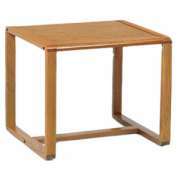 Reception area furniture is about more than just seating. When visitors come in to your business or institution on a cold or rainy day, they will also need a place to hang their coats. The waiting room is the ideal space for a coat rack because visitors can easily pick up their outerwear as they exit your workspace and won't have to carry around jackets as they hunt for an appropriate place to put them. Lesro coat racks come in both freestanding and wall-mounted models. While free-standing units have a classic old world charm, wall-mounted hooks leave more open floor space. 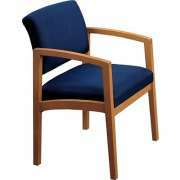 The versatile design of Lesro chairs makes them a perfect fit for virtually any part of a work space. 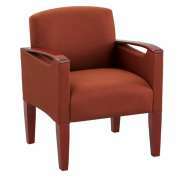 Swivel office chairs can be used by professionals as they sit at their desks throughout the workday. If you need a temporary solution for seminars or multi-purpose areas, some guest chair models are also stacking chairs, so they can easily be put into storage or transported from place to place. 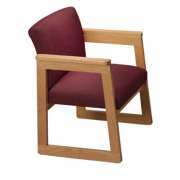 Great guest chairs will also fit well in a library around some wooden study tables. 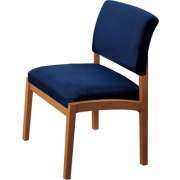 If you are tired of the same old school library furniture, and are looking for a way to update your space, new library chairs can get the job done. Let students and employees take advantage of comfortable padding and liven up your space with a uniform upholstery hue or some vibrant complementary colors. In addition to experiencing the reception area, many clients, colleagues and potential donors will spend significant amounts of time in a company's conference room. When negotiating a company merger or long-term contract, you want to make sure that this critical venue has a comfortable yet professional atmosphere. Some attractive and cozy guest seating will keep all meeting attendees properly supported so they can focus on the discussions that are taking place. 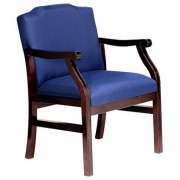 Appropriate seating will demonstrate the competence and financial stability of your company or institution. 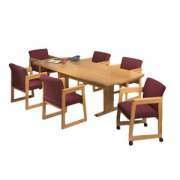 High- and low-back swivel office chairs are also a viable option for conference room seating. They will help meeting attendees find a more comfortable position, as their design promotes flexibility and movement. Casters make office chairs easy to arrange and move around when setting up your space. Whatever the size of your conference room is, you need a conference table so everyone can lay out notes and important documents. 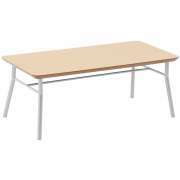 Conference tables come in a number of shapes including racetrack, octagon, boat and oval. 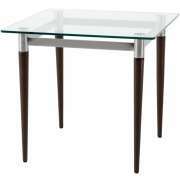 Solid wood tables are super sleek and sturdy. 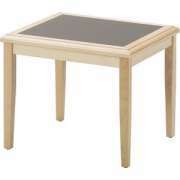 They create a serious atmosphere that is conducive to tough negotiations and discussions of critical decisions. Demonstrate the professional competence and aesthetic sense of your company or institution with reception furniture, conference tables and library furniture from Lesro. 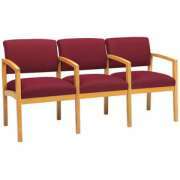 The simple elegance of each model can fit a company of any style or size. If you need help narrowing down the choices or choosing the perfect upholstery colors, contact the Hertz Design Center for free project-planning advice.